This is one book every Intelligent Investor must have ! In the complex world of speculation, even the best of the businesses can’t escape losses. There are so many analyses, trends, which may leave you confused. Can you trust them? You, however, can trust Vedic Astrology that takes into account ONLY the Planetary Positions, thereby bringing you an entirely unbiased, reliable perspective. You will get the Astrological high and low points at Nifty, Sensex, Dow Jones, NASDEQ, Nikkei, Hang Seng in the coming 12 months. A clear indication of the active and highly volatile periods and dates during year 2019-2020 also has also been added to ensure you stay guarded all the time. This priceless astrological guidance will help you keep a safe distance from the deceptive market trends. The coming 12 months have been divided into 15 time-slots, wherein you get reliable, clear prediction for each time-frame. Plus, this time we have divided the entire Financial Year in 12 months – so you also get the month-wise predictions for the whole FY. You may,thus, take your positions accordingly to earn maximum profits. The Opening trends and the projected graph for the year ahead will prove extremely helpful, especially to the F&O and Option traders. 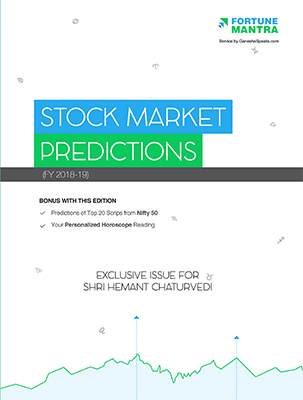 The Bonus sensitive time zones’ predictions on 30 more companies from Nifty 50 are not the only happy gifts we bring you in this FY’s Market Predictions book. With each book, the user shall get his/ her Personalised Stock Market Report – which will tell you all about the favourable, unfavourable and investment worthy sectors in the times to come. Plus, you will continue to get your customised Monthly Nifty trend chart for each month and weekly predictions for each week. Our Astrologers short-listed 20 important/ major companies listed in the Nifty-50. You will get specific predictions related to these 20 Scrips in this FY’s book. And, that’s not all! As a charming bonus, you get predictions on sensitive time frames for 30 more companies listed (as of now) in Nifty50. This means, you now shall have access to excellent investment advice, basis planetary transits, for all the companies listed in Nifty50. Moon Sign governs the MIND. Know how your Moon Sign will interact with the in-effect planetary combinations in the next 12 months to bring you various results. There will be specific emphasis on the finance related predictions as well as remedies that will help you stay guarded. Get predictions for Gold, Silver markets in the FY 2019-20. The Book also gives you important forecasts pertaining to the INR – Rupee – the very important currency, whose position/ status may make or mar our strategies.